The latest news in how global warming is wrecking the world; scientists have reported that a massive crack in one of the world’s biggest ice shelves has grown tremendously in the last five months alone. It has grown an extra 22 kilometres (13.67 miles) to be precise and now is of 130 km (80 miles) in total. This mammoth ice shelf known as Larsen C will break free very soon according to the scientists, and if, or rather when this happens we will have the third largest loss of Antarctic ice in our recorded history. The Larsen ice shelf consists of three smaller ice shelves, Larsen A, B and C. All three of them are located on the coast of the Antarctic Peninsula, and the ice shelf has already seen massive declines over the past two decades. 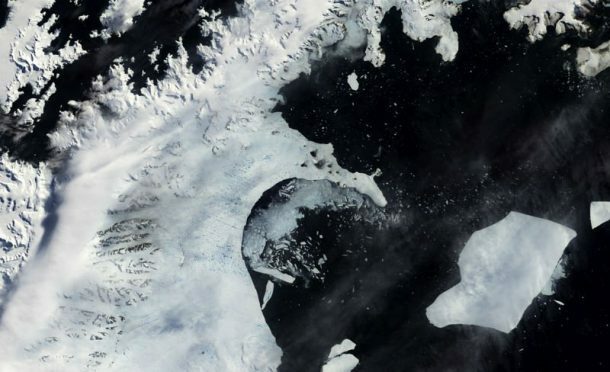 In a report published by Project MIDAS, around 12 percent of the entire Larsen C ice shelf is expected to break off, which will leave the ice shelf in its most receded position ever. Computer modelling also builds on this bad news by predicting instability in the rest of the ice, causing Larsen C to follow the example of its neighbour Larsen B, which disintegrated in 2002. Larsen B has been a stable ice shelf for at least the past 12,000 years, but it has receded to a mere area of 1,600 square kilometres (625 square miles) now. And what’s worse, it is still declining at an alarming pace, expected to be fully disintegrated by the end of this decade. Already Larsen A ice shelf disintegrated in January 1995, and it seems like Larsen C too will follow its footsteps. Larsen C’s possible loss is huge since it covers around 55,000 square km (21,235 square miles). To give you an idea, that’s about 10 times the size of Larsen B, and about half of the entire Iceland! Upon breaking an iceberg measuring about 6,000 square kilometres (2,316 square miles) will fall off into the ocean. And once the iceberg has calved off entirely, there the ice front might crumble backwards. Adding insult to injury, a recent study published in Nature Communications reported that hundreds of “meltponds” have started to form on the surface, which will only accelerate the disintegration process. And if Larsen C does lose all its ice, this could raise global sea levels by around 10 cm (3.9 inches). But in all this doom and gloom, Nature Climate Change recently published that Larsen C consists of a lot of ‘passive’ ice that it can lose without major consequences,” So this is a small glimmer of hope in what seems to be an impending disaster for the world, though the MIDAS team fail to share this optimism. Have anything else to add to this article? Let us know in the comments’ section below!